Ensuring public access to transportation is a solution to gridlock and runaway pollution. It also happens to be less stressful, allowing time for conversation, book-reading, or a quick nap. At less than $2 a ride, CARTA is a public asset we can all experience. The CARTA Superstop (pictured above) is located at the intersection of Cosgrove and Rivers. 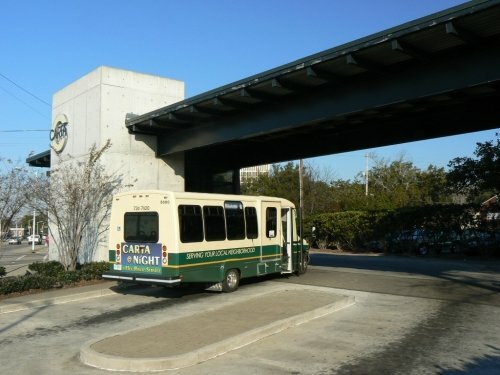 It acts as the central bus stop on many routes through the North Charleston area. Inside the small building, you’ll find restrooms, a few chairs, and a small snack bar. It’s a warm place to stay on a cold day. From the Superstop, you can easily reach many parts of metropolitan Charleston. The CARTA Express buses have been successful at bringing fast reliable service to commuters from James Island, Mt Pleasant, and North Charleston. The interior of the buses are clean and spacious. As express buses, they make only a handful of stops on their routes, serving long-distance riders better. When we missed our stop, everyone aboard pointed us in the right direction. For more information on CARTA routes, schedules, and fees visit the agency’s website here. 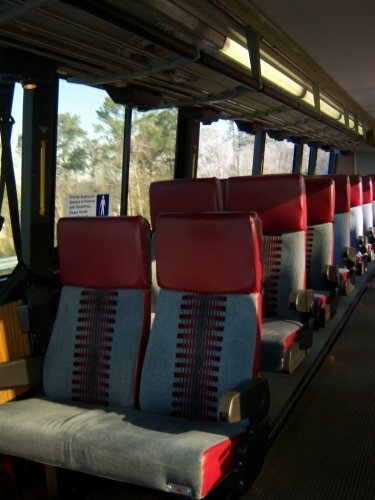 Learn more about public transportation in South Carolina. Go to the North Charleston photo gallery.